As everyone knows, the American economy is in the pits these days. Sadly the effects of that were clearly visible at Toy Fair, with booth sizes scaled back from the incredible to just the reasonable, and the 'give aways' either drastically reduced in awesomeness or completely non-existant. A company who bucked this stingy trend in grand fashion was our good pal Mezco Toyz, with a Jason figure from their brand new 3 3/4" scale series set to release this fall! 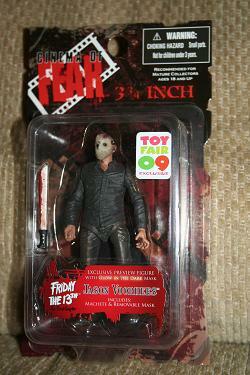 Single carded specially for Toy Fair, with a sticker to prove it, Jason is looking fantastic in his new scale. You can even remove his mask! Though we'll probably wait until the fall and buy a mass-release one to check that out, because the exclusive set is just too pretty to bust open! Click the link below to see more images of this great give away, and big thanks go to Mezco Toyz for figuring out how to keep the fun alive in these troubled times. This was one of the big reasons I wanted to go to TF this year. But I suppose I will have to wait for the normal release for Jason to kill Duke.